Ahoy, Matey! Get your sea legs ready as you board this ship on a voyage to find the booty! Our Pirates Revenge, which seats up to twelve riders in open bench seats, soars back and forth through the air to the delight of its passengers. The height of the ship’s swinging is controlled by our operator, to allow for participants that would prefer a less intense ride. 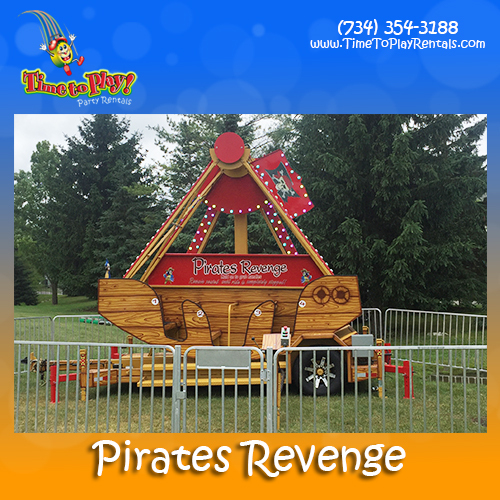 Pair our Pirates Revenge with other carnival rides, large inflatables and interactives for a full-scale festival. We are always more than happy to assist you in selecting the best variety of rides for your event.